The first time that pianist Kimiko Ishizaka came to my attention it was through a recording of the Goldberg Variations, by Johann Sebastian Bach; a project called the “Open Goldberg Variations” which produced both a new score, under a Creative Commons License, as well as a Public Domain recording, which was free for anyone to download. At first, I was dubious about the whole thing, though it sounded intriguing; there is always a question in the subconscious mind as to whether something being offered for free will be of the same quality of a “premium” product, which was my question: how would this free recording of a piece measure up to those recordings made by such luminaries as Glenn Gould or Angela Hewitt, to name but a few of my favourite performances. Well, as my review of the “Open Goldberg” testifies, the recording was better than fine, it was – and remains – an exceptional example of an extraordinary musician putting their talent towards what I like to refer to as the democratization of music, and the performance remains one of my favourites to this day. Making music available for people to enjoy is laudable, but creating original recordings of repertoire that stands in comparison to the finest commercial recordings: that is something that is simply not normally encountered within the music industry today, and the performance, quite frankly, blew me away. Thus, hearing that Kimiko Ishizaka was taking on the first volume of Bach’s Well-Tempered Clavier in another “Open” project left me with nothing but warm feelings as I began delving into the recording, while giving me an excuse to refresh my memory of her fine performance of her Goldberg, which I had not indulged in for a while (there is so much to listen to …). Composed in 1722, while Bach held the position of Kapellmeister to the Prince of Anhalt-Köthen, the Well-Tempered Clavier (or WTC) book 1 is a collection of 24 Preludes and Fugues in each of the major and minor keys. The title page, written in Bach’s own hand, includes the following comment, which reveals a great deal about the importance of the music: “The Well-Tempered Clavier or Preludes and Fugues through all the tones and semitones including those with a major third or Ut Re Mi as well as those with a minor third or Re Mi Fa …” That instruction, regarding the major and minor thirds has to do with the tuning of the instruments upon which the music would ultimately be played. Otherwise, the Wolf would make an appearance and howl during certain parts of the music. The Wolf Fifth occurs when “meantone temperament” tuning is used, in which an adjustment is not been made to any of the fifths in the cycle of fifths to make it slightly “smaller” in order to tune it in relation to the surrounding intervals. Meantone Temperament was a common form of tuning from before the beginning of the Baroque period and resulted in certain keys sounding quite decent on a particular instrument, while other keys would sound more and more out of tune, the further they were from the fundamental to which the instrument had been tuned. This would result in a sound described as “howling” in character when a particular perfect fifth resulted in an unbalanced interval. The direction on Bach’s title page to the WTC, however, gave the key to the elimination of this issue, indicating that the major and minor thirds (Ut Re Mi, and Re Mi Fa) were to be tuned in a Well-Tempered manner, allowing for the fifths of the chords, the cycle-of-fifths, to be “perfectly” in tune (or, as some might argue, equally out of tune), throughout the full range of the instrument. In some circles the debate still goes on as to whether equal temperament has destroyed certain characters that existed in the individual keys of early music; but this is not what this review is here to debate. If the idea of equal temperament was good enough for Bach, that’s fine by me. For better or worse, equal temperament allowed composers to explore music in every key, without regards for the presence of the Wolf, or other howling intervals, which helped open the pathway, ultimately, to the emancipation of tonality itself, leading to the abandonment of diatonic composition in favour of “free tonal expression” by contemporary composers. It must, however, be noted that not all instruments adhere to this tuning system: when string players take up their instruments they use “Just” tuning, based on the Pythagorean System of the division of the string. This can occasionally cause issues for younger players when they rehearse with a pianist for the first time and discover that their intervals are not always in tune due to the equal temperament of the piano, but mature players are able to make the necessary adjustments in order to make beautiful music together. It must be noted that Bach did not devise the tuning system used in the WTC, though he was the first composer to fully exploit it with a large-scale work in every diatonic key. This is why, for many musicians the Well-Tempered Clavier represents the Old Testament of Piano (or keyboard) music, while the New Testament of Piano repertoire would have to include the 24 Preludes of Chopin, which were directly inspired by the WTC, along with the Piano Sonatas of Mozart and Beethoven; one could well argue that the Etudes, and other piano works of Liszt, could be considered among the Epistles within the canon of the piano New Testament. When approaching the Bach one is immediately confronted by the immensity of the task: twenty-four Preludes and Fugues: it seems daunting, perhaps even overwhelming. A musical challenge that might make a lesser musician balk at the challenge. Many times I have heard people say that they do not enjoy the music of Bach; that it is “too difficult”, or “too hard” to listen to, but my belief is that they have either not heard it played well, or not heard it played with tremendous musical intelligence: there are far too many poorly performed recordings available, which does a great disservice to one of the greatest musical minds to have ever lived. Kimiko Ishizaka is not that kind of musician. Her playing goes far below the surface of the music, bringing to light a performance that is both rare, and unaffected, though far from unemotional in her technically brilliant playing, as well as being supremely intelligent. Having had an opportunity to view some of the music used for the preparation of this recording there can be no doubt that Kimiko Ishizaka’s preparation for this recording was as monumental a task as the composition of the work must have been; the loving, intense care with which she analysed virtually every note of each piece demonstrates a musical mind at work that reminds me of the process of what goes into the composing of a piece, something with which I am intimately familiar. 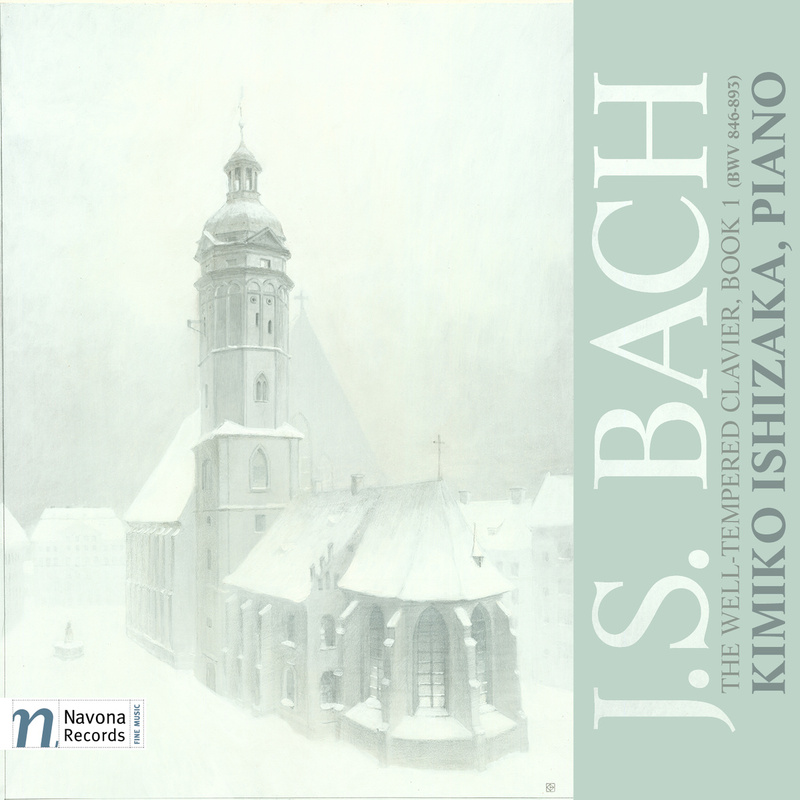 While there are some purists who eschew the performance of Bach on modern instruments, this does not bother me: after listening to the “Open Well-Tempered Clavier” performed by Kimiko Ishizaka I can only be left with the feeling that, had Bach been given the opportunity to hear his masterpiece performed on a modern piano, he would have been well and truly pleased. Kimiko has found, through this recording, an abundance of musical brilliance to share with the audience, without resorting to over-sentimentality. She is never tempted to turn the music into something it is not, which is apparent from the opening of the Prelude No. 1, in which her phrasing exemplifies her ability to avoid the temptation to use the sustain pedal, opting instead to use her hands to bring out the inner-voices of the music in a way that adds new life to an extremely familiar piece. This is a Prelude that virtually every piano student, myself included, has played, and it is impossible to not compare oneself to the recording when you hear it: I can assure you, when you hear what has been recorded here, you will be amazed at the musical restraint, and rewarded by what comes afterward. While the playing of the Preludes is outstanding, it is in the contrapuntal expression and the clarity of her voicing within the Fugues that truly demonstrates the mastery which Kimiko Ishizaka has over her musical materials: this is not a pianist who is casually familiar with her music. Each note and every voice has nuance and meaning. In some ways it reminded me of the playing of Glenn Gould, without the voices he added with his singing (thankfully); it is playing of the highest calibre indeed. Kimiko is a pianist performing with an intense intelligence, demonstrating that she is both a consummate artist who is reaching the peak of her artistic and expressive abilities; a pianist who will not disappoint. The quality of this recording is without peer. Sound quality is not a question, nor is the quality of the instrument used for the project, which was performed on a Bösendorfer 280, an instrument with outstanding sonic capabilities, which flourished under the capable hands of Kimiko Ishizaka. If you are interested in seeing a live performance of the 24 Preludes and Fugues, you can watch a video of Kimiko Ishizaka perform the WTC live, as well as download the recording for your private enjoyment, all for free. If I could say anything negative about this project it would be that there are currently no plans to release Book 2 of the WTC … however, the next project in the works for this talented pianist is a project to record and release, also under a Creative Commons License, the 24 Preludes by Chopin, which will be recorded on the same type of piano on which they were composed, a Pleyel, the instrument Chopin preferred to perform on during his life. He dedicated his Preludes to Camille Pleyel, the maker of the piano. The Pleyel was quite different than the modern, double-action, instrument we know today; it had a wood frame rather than the cast-iron frame found in the modern piano, and a single-action, but if any pianist is up to the challenge of bringing this music to life, Kimiko Ishizaka is that pianist. It should be an incredible thing to behold and I’m looking forward to both hearing and seeing it as well. This is a MUST HEAR Recording … So … What are you waiting for? GO … follow the links, listen, and enjoy!